A 100% heavy pot still whiskey with a high sherry ageing percentage. One of our all time favourite Irish Whiskeys. 'Stupendous nose....just a sip is enough to fill your mouth with a multi-layered attack of malt and pepper plus a few sherry notes with the pot still arriving on the 2nd wave and refusing to budge...this is a marvellous whiskey' Jim Murray A Taste of Irish whiskey. 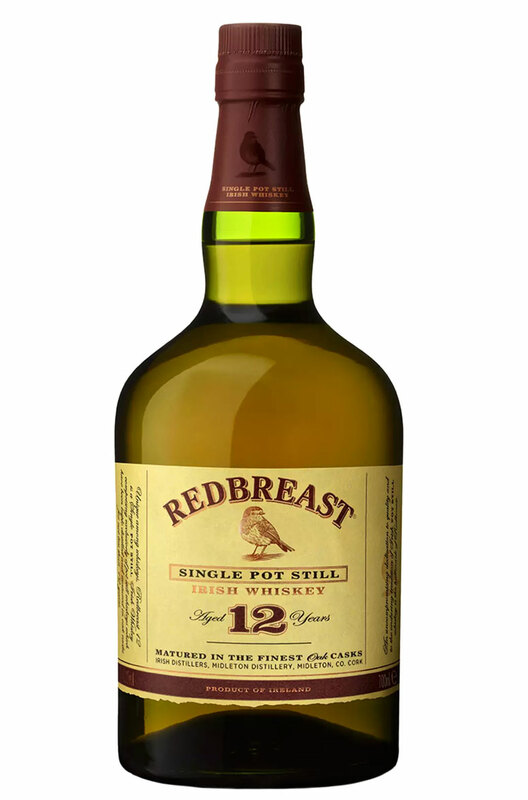 Redbreast was a brand name for Jameson's pure Irish pot still, bottled in bond by Gilbeys. First made in 1939 with Jameson filling Gilbey's own casks. Two sherry casks were used for each bourbon cask. The brand died off with the closure of Jamesons distillery but was recently relaunched and is a huge favourite with both whiskey drinkers and connoisseurs. Really deserves to be marketed worldwide! Awarded 'Irish Whiskey of the Year' in Jim Murray's 2010 Whiskey Bible. Nose Aromas of crème caramel, toffee and dried fruits with some touches of spice and coffee. Palate Rich and oily on the palate with flavours of dried fruits, roasted nuts and exotic spices. Types of Barrel used for Aging Oloroso Sherry Casks with some ex-Bourbon barrels. 2010 Irish Whiskey of the Year 2010- Jim Murray's Whiskey Bible. 96/100.